A sturdy woodshed to stand the test of time. The walls are made of pressure-treated (P.T.) Southern pine boards spaced 1-inch apart, allowing air to circulate to the interior. 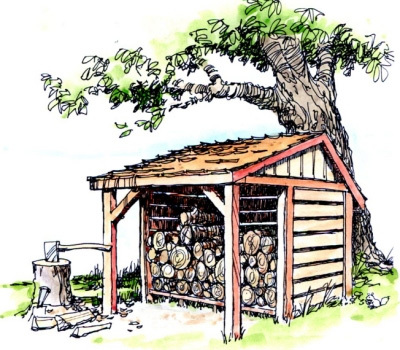 A south-facing woodshed brings in maximum sunlight to season the firewood. The woodshed is big enough to hold more than a cord of wood. 5 pages include construction plans, materials list and instructions. The hand drawn plans consist of five (5) pages, which include construction plans, a materials list and step-by-step instructions.